Instead of playing the latest and greatest games at Cologne's Gamescom expo, I'll be playing a 2009 Legend of Zelda game. What else would I do when faced with 12-plus hours of travel? 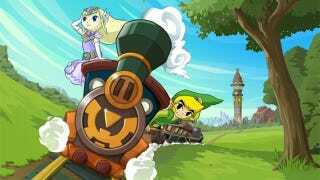 I'll hopefully wrap up The Legend of Zelda: Spirit Tracks this weekend, somewhere over the Atlantic Ocean. I'd really like to put it behind me, because it's... a little tedious. But I'm determined and will probably only sneak away from touchscreen controlling Link for a few rounds of Dungeon Raid. What about you? Playing anything good this weekend? Are you at Gamescom? Let us know in the comments and maybe we can get some sausage!